This is an amusement park with child-friendly rides - bumper cars, merry-go-rounds, bumper boats, etc. There are also a couple of roller coasters (the wooden one is surprisingly very fun), a mini-golf course, and go-karts. You can buy a wristband good for unlimited rides and mini-golf for $20. There is a special section for littler kids too (under 4 maybe). We went on a Friday afternoon and there were short or no lines for the rides. Overall, a very fun day. Kindermusik with Debbie is a great way to expose your child to music and dancing. I highly recommend the program. It's a great way to bond with your child. Debbie is an experienced teacher and great with children. The Kindermusik program is of high quality and has a great curriculum for children 0-7 years of age. You can preview a free class by contacting Debbie. Hero's offers a 'Stay & Play' open house which has indoor inflatables, a game arena, and carnival games. This is a great place to take the kids to get some entertainment and burn energy. The staff are great. They are friendly and keep the kids entertained. It's worth the drive. They also offer concessions on site. For hours and pricing, take a look at their website. The "Ducks" are boats with wheels that were used to move troops during World War II. Nowadays they are used to take tourists through the woods of the Wisconsin Dells and up the Wisconsin River. Other than a few uncomfortable minutes where they try and sell you a book and postcards in the woods, the rest of the hour long ride is a nice change from waiting in line at the other attractions in Wisconsin Dells. It is about $20 for an adult, $6 for kids, and young children are free. Burke Park is a nice, shaded park with a climbing gym that has a toddler section for the little ones and a more challenging area for the older kids. It also has swings, a teeter-totter and a train sandbox. There is a covered picnic area when the kids need a snack or lunch. Wonderful park. It's worth the drive to the town of Burke. The Arboretum has over 1000 acres of plant life and includes wetlands, forest, ornamental trees, prairies and more. The best part about the Arboretum is its countless and varied hiking paths. We go there dozens of times each year, and we always seem to find new trails to explore. Some go through deep woods, others cross an open plain. Some are hilly, some are flat. Some go by water, and some traverse sandy stretches. There's even a boardwalk that extends over a marsh. We put our little one in a front carrier and let our preschooler lead the way. We're so happy to see our kids enjoy the Arboretum, and it's especially fitting since it's where we first got engaged! While this facility is geared to adult sports leagues, in the winter months they offer kids "open play" on Mondays and Thursdays from 9:30 a.m. - 1:00 p.m., as well as Saturdays from 11:00 a.m. - 2:00 p.m. It's primarily geared to very young children (7 or under) and features stations with different activities (e.g., t-ball, soccer balls, hoola hoops, bouncy castles, running space). It's a great way to let the kids run off some energy and costs just a couple of bucks per visit. About the only thing going for this park is that its near our house. The play equipment is sparse especially compared to the one on the other side of the fence at the apartment complex next door. Monty's is a diner on Madison's near east side. It has some diner fare, but it also has some really tasty vegetarian twists like the "Sheldon", a vegetarian reuben, or "Sloppy Faux" - a sloppy joe with seitan. Incredible breakfasts are also served all day. We went there on a Tuesday night and it was packed. The reasonable prices and the good food ensure a wait just about anytime you go. The staff keeps an amazing attitude with customers especially children. One of the wait staff even attempted to do the pretend ice skating routine that was being given. Just to add to the heaps of praise: get pie there. It is awesome. A few weekends ago, we went to Minneapolis for a family reunion. We stayed at the Sheraton in Bloomington, MN. The price was extremely reasonable the weekend we were there. It was right off 494 so it was only 10 minutes to Minneapolis for the reunion, but more importantly IKEA and Mall of America. The hotel was full of families attending a conference. Yet it was fairly quiet in the rooms. When you opened the door there was always someone crying, yelling, or running up and down the hallway, but inside our room, you couldn't hear anything unless they were right outside. We did hear a girl crying a little bit, but it was so quiet that if we didn't have super parent-of-a-baby hearing, we probably wouldn't have noticed. We were supposed to have a crib, but when we asked they told us "rooms are reserved, not cribs". We had a Pack and Play with us so it wasn't a big deal, but it might have been for someone else who was traveling lighter. A hotel's pool comes in a really close second to not hearing every little thing that your neighbor does there. The pool was a good size and accommodated the large number of kids swimming and jumping in the pool. There weren't any steps so our three year old daughter couldn't get out of the pool easily and getting in to take a baby for a dip it out of the question since it would be really hard to climb up and down the ladder and hold them. The pool area tile was also super slippery. The hot tub was really generous and there had to have been twenty people in there at one point. It was easier to get in and out of carrying a child and our daughter could get out herself if she needed to. There was also a small Little Tikes playset area for smaller children near the pool if they didn't want to get wet or you have to motivate them to get out of the water. There was a restaurant, bar, and a TGIF nearby, but it didn't seem like much else to walk to. Overall, the rooms were good size and the staff was extremely nice. The pool was alright, but for taking a dip with smaller children go to the hot tub. There is a lot to do nearby if you drive. Bay Beach Amusement Park is located in Green Bay, Wisconsin. My parents would take my sisters and I here every summer, and we looked forward to it every single year. There are a ton of rides for kids of all ages and there's no admission fee, plus at twenty five cents a ticket, the price just can't be beat! Most rides cost only one ticket, a few like the carousel, the bumper cars and ferris wheel are two tickets. Plus, there's a train that takes you for a little ride around the park. If you have kids, you MUST check out this fabulous place! Parent/Child Playtime, a Madison School and Community Recreation Program,takes place at Warner Park in Madison. A great open space to take your 0-5 year old where they can run, climb, ride trikes and other riding toys and play with various age-appropriate toys. Located in Warner Park's gymnasium, Playtime is a wonderful place for kids to interact with other kids and develop social skills, while parents get a chance to chat with each other. It takes place every Monday, Wednesday and Friday from 9:30 to 12. A Family ID to Warner Park Community and Recreation Center is required, but this yearly pass is quite inexpensive (I think ours was $10). There is a $3 entry fee, but you are allowed to try it for free the first time you go. This place is INVALUABLE to us in the wintertime when there are few other places to let your kids run around and release all that pent up energy. The Madison Children's Museum is a fun place to take your kids. They have many exhibits and play areas where kids can really get involved, whether it's pretend play, making music with instruments or brushing a cow. They also have many programs for toddler, preschool and school-aged children. If you live in the Madison area and have kids, I would highly recommend purchasing a yearly membership, because if you attend any of the weekly programs for kids, your admission is then free. Definitely worth it! It does get crowded because of it's popularity, so I recommend going early in the a.m.
Green Bay, Wisconsin has a new zoo and it's called The NEW Zoo! The NEW Zoo has many animal exhibits, including a Snow Leopard, a Red Panda, and my personal favorite, the penguins. The most incredible spot at the NEW Zoo has to be the Giraffe lookout tower where, twice a day, you can get an eye-level view of the giraffes and actually hand-feed them! It's amazing!! I have never had a cooler experience at a zoo. 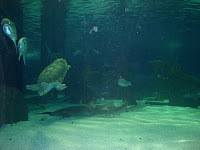 The aquarium at Mall of America near Minneapolis, MN is awesome even if it's too short and a little pricey. The attraction starts with a walk down a simulated canyon with taxidermy mounts including a fox, skunk and muskrat. I'm not exactly sure why it starts that way, but I think maybe it was to simulate the flow of water down the Continental Divide to the ocean. After the short trip down, you finally arrive at the aquarium itself. It is incredible. The fish are huge. There were saw fish and nurse sharks that had to have been 10 or 12 feet long. There was also a turtle the size of our coffee table! I was glad to see that after trying in vain to point out "Nemo" amongst all the animals swimming around in the big tank that there was an exhibit that had fish and jellies from "Finding Nemo" in it. That saved a lot of time answering the "Where's Nemo?" question. After seeing all the animals, I understand why it was $17 for an adult(13+) ticket at the time of this writing, but it seemed really short probably because the people mover, despite its slow speed, still moves you through pretty quickly. We walked back to the start a couple of times along the part of the floor that doesn't move. It let us see all the animals and really spend some time there. Definitely step off the mover and look at the fish. Kids under 3 were free.